For some reason, all my friends in Ipoh wanted me to watch A Nightmare On Elm's Street. For some other reason however, horror and gory movies never agree well with me. It makes me pee. And i certainly do not want to be starring in my own horror movie after watching how Mr Freddy horrifyingly kills everyone. Jalan Tawas Baru 13 happens to be the street i'm living on. So yeah, i do not want to start a Malaysian style horror movie where everyone dies and i pee in my pants. Luckily for me, i managed to convince all of my friends who wanted to watch A Nightmare On Elm's Street that i will pee in the cinema if they insist on watching the movie. Not wanting to smell urea halfway through the scene where a girl is being is being brutally killed with all her dress torn off, my friends reluctantly agree to let me watch Ip Man 2. That was in the afternoon. I'm sure many of you would have already watch the movie or at least read the reviews. Which means there's no point for me to review the movie again. In short, Ip Man 2 beats Iron Man 2 hands down in terms of plot and action scenes. At least Ip Man fought longer in the action scenes. Favorite quote of Ip Man 2: "Every person may have different status in this world, but that does not mean our dignity is any different". I wonder what happens if Iron Man goes 1 on 1 with Ip Man? Later at night, it was another movie outing again. Another round of suggestions to watch A Nightmare On Elm's Street. I wonder why sometimes people like horror movie. If you really want to see blood that much, just go to any blood donation centers and you can see lots of them. Of course, thanks to my peeing-in-the-cinema threat, Ice Kacang Puppy Love was picked. Directed by a Malaysian singer, Ah Cow, ops i mean Ah Niu, this movie talks about the experience of a person's first love. Overall, the movie is sweet, simple and funny. It does not bore you with a complicated storyline and make you shudder with cold jokes. The movie also manages to send out a touching message to the audience. A must watch if you're a Malaysian (support local movie-lah) and if you're looking for a simple romance comedy. Like my favorite ais kacang, it lets me savor every moment of it. Too bad the movie (spoiler alert!) did not have a happy ending though. But i guess that's what make this movie special. Honestly, there are not many people out there who managed to stay with their first love / first crush forever. Heck, even for me, my first crush was taken away by a guy because i do not have the guts to confess and my first love ended after a week because the girl dumped me. The only difference now is that Botak (Ah Niu) in the movie got himself another girlfriend while i'm still stuck here single. So Sad. I've included a trailer for Ice Kacang Puppy Love if you have yet to watch it. Hope you'll like it. I like IpMan 2. Ironman 2 is not nice. 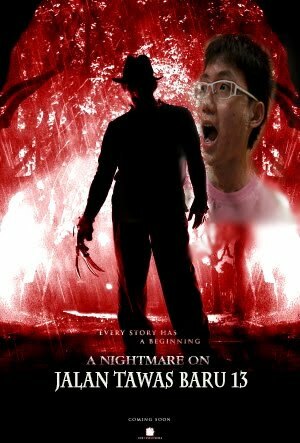 Nightmare on Elm Street will make u pee not bcuz it's scary. Might be bcuz it's ur laughing yr head off.. Me, faris n alex did LOL throughout the movie.. haha somehow v find it to be funny..
@Ken: Must watch Ip Man! It's nice! Ip Man 2 was awesome though!